The topography of hemiplegia is much more complex than diplegia. The differences relate both to the type and extent of brain damage as well as the timing of the injury. It is important to get a clear picture of these different patterns in order to best focus treatment of the motor problems as well as to understand what other problems may co-exist with the hemiplegia. What types of brain injury or maldevelopment create the hemiplegia topography? In spastic hemiplegia, the defining feature of the topography is involvement of the arm and leg on one side of the body. There are 2 common patterns: The preterm pattern with the leg most involved and the full-term pattern with the arm, hand and speech muscles most involved. Preterm pattern hemiplegia is caused by periventricular white matter damage that is most predominant on one side. While both hemorrhage and ischemia can cause white matter damage, large hemorrhage (Grade IV) is one of the most common causes. There may be a smaller bleed on the other side and some degree of PVL bilaterally. The pattern these combined lesions cause is often called a triplegia with both legs and one arm involved. Most of these babies are born at less than 35 weeks. Full-term pattern hemiplegia is commonly caused by a middle cerebral artery stroke or cavernous sinus thrombosis or a predominantly one-sided cortical watershed injury. These two injuries are diagnosed by brain scan in babies with Neonatal Encephalopathy (NE), also known as Hypoxic Ischemic Encephalopathy (HIE). Whichever name you use for it, both are caused by asphyxia prior to, during or shortly after birth. These create widespread cortical injury in the areas of damage that predominantly affect the upper girdle that includes the trunk, arm and hand as well as speech. Most of these babies are late pre-terms or full-term births. Mixed patterns of hemiplegia are less common and include Intrauterine stroke, later neonatal and infant stroke, as well as several different types of brain maldevelopment that are predominantly or fully one-sided. They are often diagnosed by brain scan and by the very fact that these infants present with a different cluster of problems than either the preterm or full term patterns described above. The pediatric neurologist is the primary specialist for this smaller group of children. For those in the preterm and full term pattern group, with all the techniques that we have now to manage spasticity and body alignment, they should walk normally, but the majority of these children do not walk normally. Achieving a normal gait pattern requires early intensive management of the lower limb spasticity that is continued until they stop growing. They nearly all walk badly and run well as they grow older. The persistent abnormal walk is a habit learned early with a damaged immature brain. They run with a recovered corticospinal system and a more mature brain. (The Boy Who Could Run Better Than He Could Walk). Early habits can be changed with focused intensive practice and correction of body malalignment issues. It often does not happen until the child turns into a thinking, motivated teenager. Adapted sports programs are often the first to recognize how competent the child’s motor system is when they see them perform at a much higher level during competition than when they are walking with their usual gait. I would love some of the parents of teens in programs like Blaze Sports (http://www.blazesports.org/ ) to comment on this blog and share a bit of their child’s story. The children with mixed patterns of hemiplegia and those with triplegia may take longer to achieve walking and they may need more help to achieve their own best possible function. But they will get there. That was the good news. In my long experience in North American and Europe, the trunk, arm and hand use is largely neglected. Part of the problem is not recognizing which children need the most help, so everyone gets the same treatment approaches. The part of the brain that controls the hand in the child with preterm pattern hemiplegia and most of those with triplegia is generally not badly affected and like walking, they pretty much learn to use it on their own as an assisting hand. Great. They are functional. But at what cost? They do well early, but nearly always run into problems at school as the demands for better, faster, bimanual skills goes up. In my opinion, it is time for a change and we have to let the Early Intervention and Birth to Three programs know that there are problems later in childhood. The standards are set far too low in the early years as using the hand as an assist is often considered “good enough”. Again, by the time the child or teen is old enough to play sports, you can better identify the difference between the usual behavior and the recovered potential. It is not unusual for the child whose hand normally hangs neglected at his side to accurately block and throw with both hands on the basketball or volleyball court. Habit Hides Recovery of the hand as well as the leg. Children with preterm pattern hemiplegia have a similar low risk of co-morbidities and their treatment issues are similar to those in children with spastic diplegia or monoplegia. Most relate more to their premature birth than to the brain damage that is causing the cerebral palsy. What therapies and treatments have the most research back up? 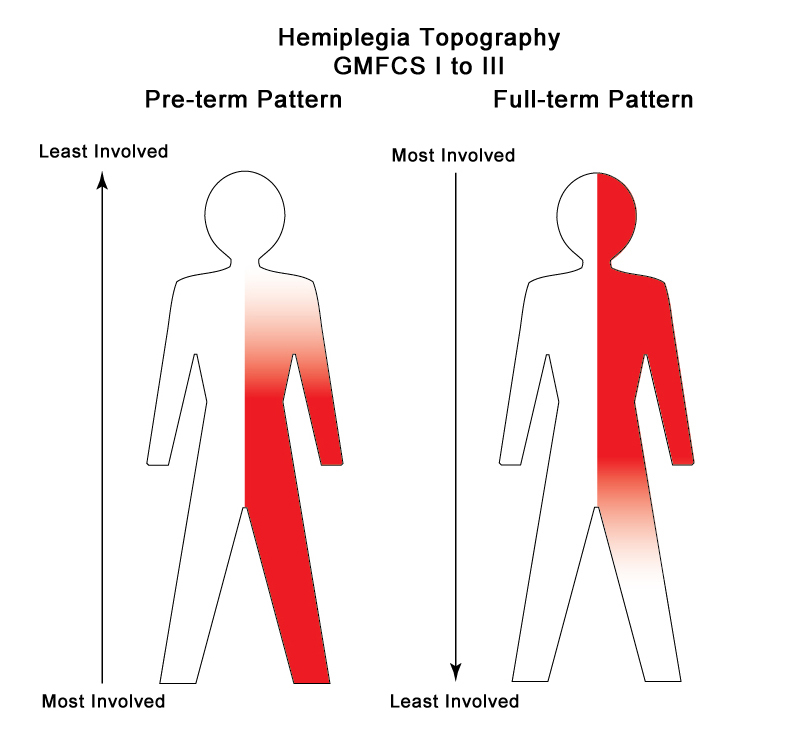 In Cerebral Palsy – Hemiplegia – GMFCS I to III – Part Two, my next post in the series, I will outline the risks of other sensory or brain problems that co-exist in the children with the full-term pattern and mixed varieties of the Hemiplegia Topography and what we now know about both diagnosis and treatment. I am putting this information into a separate post as there are more issues to deal with and fortunately, more treatments and interventions that work. I always seem to end up writing a bit of good news/bad news, but again, although we now have evidence-based and best practice interventions available, access to and use of these approaches is still limited in most areas. I believe that the only way to change what is actually provided to help the children is to create a well-informed parent base. Remember, even if your child is covered by a government insurance plan like we have in Canada, you pay them and they are ultimately responsible to provide evidence-based and best practice interventions. One last note…obviously, there will be some overlap in the Topographies, but I hope that my readers will work through the entire series to build their knowledge of cerebral palsy in its different forms. I am not trying to make you into a pediatric neurologist or other specialist. My goal is to increase your understanding of your child. To do this, you have to know your child’s strengths, weaknesses and vulnerabilities and you have to learn what is not part of your child’s development.